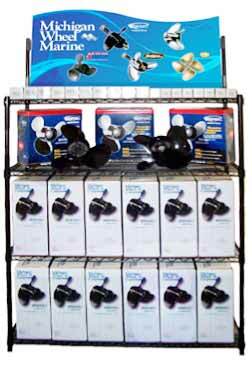 Michigan Wheel offers a broad range of propellers for almost any type of pleasure boat. Their high quality products are made with certified virgin ingot metals. That means no scrap and more consistent, durable propellers, most of which are made in the USA. Their time-tested designs come in many sizes and variations so recreational boat users can find the exact piece they need and know they’ve passed a formal quality process. They dimensionally inspect every propeller they build using the latest electronic measurement equipment. Use the Michigan Wheel Propeller Selector to search by boat length, Pitch/RPM or part number. Apollo® propellers are highly polished, ultimate performance, stainless steel wheels. Apollo® is designed to use Michigan Wheel's XHS® / XHS II® hub system, and is interchangeable with Mercury's Flo-Torq® II hub system. High performance stainless steel propellers with the proven Power Tip for peak efficiency, now utilizing Michigan Wheel's XHS® / XHS II® hub system. The blade tip and cup combine to improve bite and reduce power losses caused by cavitation. Highly cambered blade sections provide for higher speed and better bow lift. High performance aluminum propeller utilizing the XHS® / XHS II® Xchangeable Hub System. Featuring high performance blade geometry, precision balanced blades, high gloss powder coat and interchangeability with the Mercury Flo-Torq® II system, the Vortex® XHS® / XHS II® is a great choice for a replacement or spare propeller for boaters. We pass the savings on to you in the form of a high quality, better-performing propeller that typically costs less than the engine manufacturer propeller you're replacing. Every Michigan Match® propeller features a NAVAL brass spindle with a rubber cushioned hub which absorbs impact and the stress caused by shifting gears. The rubber bushing is designed to spin free under significant impact, reducing the potential for lower unit damage. Great primary propeller, yet priced as a weekend-saver spare! Ambush® towboat propellers. These propellers are 100% CNC machined for the ultimate in accuracy and consistency. Michigan Wheel Marine developed the CNC machining process for propellers in the mid-1980's and revolutionized the way propellers became manufactured worldwide. We work closely with boat builders and designers to understand what boat owners need. From ten to eighty inches, our recreational propellers can be hand finished or fully CNC machine finished. The research and development we’ve done related to underwater propulsion systems results in efficiency, speed, and durability for boat owners and operators who choose Michigan Wheel. The Aqualube bearing line, well established by the Michigan Wheel Europe and Michigan Wheel MEAA (Middle East, Africa, Asia) divisions is available in the Americas. These world class nitrile rubber bearings feature a unique flute design that facilitates the formation of a hydrodynamic wedge in operation, even at slow speeds. The craftsmanship and tolerance of the Aqualube bearings is unsurpassed.